St. Tropez does it for me! Motors running, tyre noise humming, going places you’ve never seen. The sights, the sounds, the sun, the trees, all fused in one bright orangegreen. Smiling school kids, toothless old folks, French bronzed truckers all agree your Harley is a thing of wonder, demands saluting with rock god V! Roadside cafes, fellow bikers, hog admirers, hotel keys, misty mornings, dusty pavements, snaking tarmac, shaking free of all the dull and dingy details which normal life demands as fee. Somewhere down a gladed valley, or high up where the mountains gleam you realise your world is only what your mind and eye can see. Road trip, rendezvous, relax, recharge, reflect. 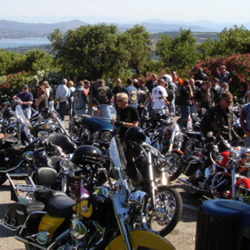 12,000 Harley enthusiasts converged on the beautiful St. Tropez peninsular in early June to take part in the annual European H.O.G. Rally. At least 150 of those were members of Chelsea & Fulham and Meridian H.O.G.. Specially laid on C&F events included a ride out and fabulous beach party. Some things go together in such a fantastic way that it could seem like something or someone way out there in the heavens decided that’s how it should be. Moules et Frites. Gin and Tonic. Harley and Davidson. The South of France and biking. Fabulous uncluttered roads, stunning vistas, brilliant sunshine and great company. That was my week and it all went by a little too quickly. The C&F Rideout on Friday was an epic event with over 60 riders tagging along for a truly breathtaking trip into the Massif des Maures hills above St. Tropez. 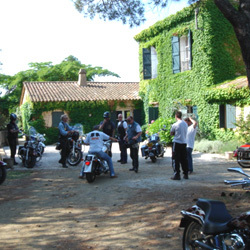 Lunch at Collobrieres enabled us to get some great group shots and the ride back to Grimaud was as good as it gets. On Saturday afternoon over 110 like-minded souls gathered at the Polynesie beach club for some great food and wine and an atmosphere that was decidedly laid back. Europe H-D boss John Russell joined us as did H.O.G. UK supremo Marjorie Ragg. It really was the place to be. I’d like to say a big thank you to Colin Houliston, Conor McAnally, Peter Scott and all the ace C&F and Meridian road crew that helped put the activities together in a fun and professional way. For a selection of photographs of Chelsea & Fulham’s journey to the European H.O.G. Rally, St. Tropez, France visit the Gallery page and click on the France ’05 tab.